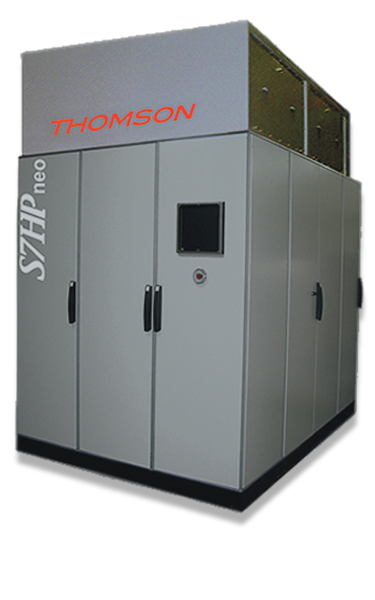 Thomson Broadcast’s S7HP neo integrates all the latest innovations based on the technology developed for the defense market. S7HP neo provides extreme reliability while benefiting from a long field proven experience in radio transmission for outstanding signal availability. The latest technology in optical fiber links, SiC junction transistors and new power supply concept have been implemented to offer the best long-term investment. Moreover, a simple push of a button allows for an easy switch from AM to DRM mode to propose Emergency Warning Functionalities (EWF). Provides highest overall radio transmission system efficiency – up to 93% including the cooling system. To reach unrivaled AM performance, built-in energy performance, built-in energy savings modes are embedded – Dynamic Carrier Control (DCC 1 to 4) as well as Amplitude Modulation Companding/Enhanced (AMC/EHC). Solution for all levels of output power and comprises an “all in one” power amplifier block or multiple blocks with a simple combiner system, which does not require the extra complexity of a balancing load. Each amplifier block provides up to 400-kW carrier output power plus 10% using 128 power modules. This peak modulation capacity is key to advertising capability. Designed with a closed liquid cooling circuit, the replacement of amplifiers is achieved without any changes to the circuit. A front door for block units allows for fast and easy maintenance procedures. Each amplifier block provides up to a 400-kW carrier output power plus 10% using 128 power modules. This peak modulation capacity is key to advertising capability. To meet all specific climatic conditions, a combined air/liquid cooling system can be customized for extreme environmental conditions.